In the interest of keeping the post to the point and brief, listed below is the latest schedule of bus service in Leh Ladakh. 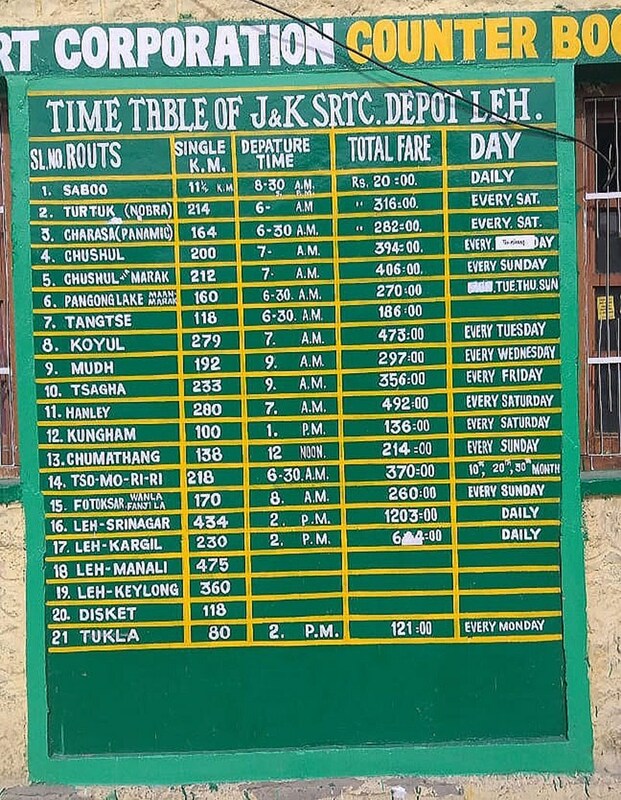 The image was clicked at Leh Bus Stand last week and in fact, shows the schedule of buses to all areas of Ladakh. With the boost in tourism and increasing numbers of visitors each year, availability of basic facilities too is improving in Ladakh. Public transport, however, is still far from being regular or reliable. As you can see in the image below, buses to local areas of Ladakh are still limited to a few days. This becomes a problem for tourists because they then would have to draft their entire itinerary as per the bus schedule. If you were in a similar dilemma, then mentioned below is information on how you can reach Nubra Valley by Bus in the year 2019. The post below only details Leh to Nubra Valley Bus service that you can avail after you have arrived in Leh. I am not including details here on you can reach Ladakh. If you want to get details on that as well, then I recommend you to please take a look at How to Reach Ladakh – A Complete Travel Guide. Once you have arrived in Leh either by public transport or flight, then how you can travel to Nubra Valley by Public Transport is what I will be discussing in this article. In order to plan a trip to Nubra Valley, you must first understand how the tourist places here are located. From Leh, you will drive up to Khardung La top which is about 30 odd kilometers of a steep climb. You will then descend down into the beautiful Nubra Valley and will arrive at Khalsar; while crossing the village of Khardung on the way. At Khalsar, the road will then bifurcate in two. The one to your right will take you to the villages of Sumur, Panamik and then Warshi. The same road in fact goes all the way to Siachen Base Camp but tourists are only allowed till Warshi. The road to your left will take you to the villages of Hunder, Diskit, Thoise and then end at Turtuk. The road actually goes even further but as a tourist, you will only be allowed till Turtuk. To understand what I described above better, I would recommend that you take a look at Nubra Valley Road Map. Now there are basically two buses that you will have to rely upon; listed in row 2 and 3 in the image above. Surprisingly, the frequency of bus service went down a bit this year. Buses available for Nubra were more last year and I am not sure why they would reduce this number and restrict it to just one day. Nubra Valley is one of the most visited tourist places in Nubra Valley and limiting the frequency of the Bus will definitely make it tough for tourists this year. Charasa is a small village just ahead of Panamik. The Bus for Charasa will leave Leh Bus stand every Saturday at 6 AM and will arrive at its destination in late afternoon. Fare per person till Charasa is Rs. 282 per person. This bus will travel across Khardung La; and through the villages of Khardung, Khalsar, Sumur and Panamik. This bus completes the return journey to Leh the next day for the same fare. The Bus for Turtuk leaves Leh Bus stand at 6 AM every Saturday and reaches its destination by late evening. Fare per person is Rs. 316 for all the way till Turtuk. This bus will travel across Khardung La; and through the villages of Khardung, Khalsar, Hunder, Diskit and Sasoma. It will return to Leh the next day via the same route and the same fare will apply. Now your entire journey to Nubra Valley by Bus will get dependent on these two buses and restricted to only Saturday. There was a bus for Diskit from Leh every Tuesday, Thursday and Saturday until last year but it seems to have been reduced this year on. Now, in order to get to Diskit, you will have to board the bus for Turtuk on Saturday. Fare per person however will be Rs. 200 for Diskit. There is a high possibility that another bus may get started for Diskit later this year on every Tuesday or Thursday but I cannot confirm it. As of now, there is just one bus every Saturday. Much like Diskit, you will have to board the bus for Turtuk from Leh on Saturday and get down at Hunder. Fare per person will be around Rs. 200. In order to get to Panamik from Leh, you will have to board the bus for Charasa on Saturday at 6 AM. This bus will drop you at Panamik and then move further to Charasa. Fare per person will be around Rs. 280. There is no Bus for Warshi. You will have to get down at Panamik using the Charasa bus and find another mode of commute for Warshi. For reaching Sumur, you will have to board the Charasa Bus at 6 AM from Leh on Saturday. Fare per person will be about Rs. 250. For traveling to Thoise, you will have to board the Bus for Turtuk that I mentioned above. For reaching Khalsar, you can board either the bus for Charasa or Turtuk. Fare per person for Khalsar will be about Rs. 200. Much like Khalsar, you can board either of the Charasa or Turtuk Buses and get down at Khardung La. Expect the fare to be under Rs. 100 per person. Nubra Valley to Pangong Bus: There is no direct Bus between Nubra Valley and Pangong Tso. You will either have to return to Leh or hitchhike. There is no booking system available; either in person or online. You will have to reach the Bus stand, board the bus and buy a ticket. Now looking at the schedule above, reaching anywhere in Nubra Valley by Bus is only possible on a Saturday. So what do you do if this does not suit your itinerary? You will then rely on shared taxis which are available every morning from Leh Bus stand itself. The taxis start in the morning at 8 AM towards both Panamik and Diskit and reaches its destination at around 2 PM. Fare per person is Rs. 400 approximately. For return journey, from Diskit bus stand, you can easily get a shared taxi for Leh. These taxis leave Diskit at around 9-10 AM. I hope the information above on reaching Nubra Valley by Bus was of help. If yo have any questions; or need any other details; please feel free to ask in the comments section below; or at our Community Forum; and I will be glad to answer.